Part P was brought in by Government and is just one part of a number of building regulations, but which from the home owner and electrician’s point of view is a legal requirement, with regards to electrical installations in and outside of domestic dwellings. As usual with any government scheme, the regulations are not well explained, have no continuity of reason for why some areas require part P certification and others do not. 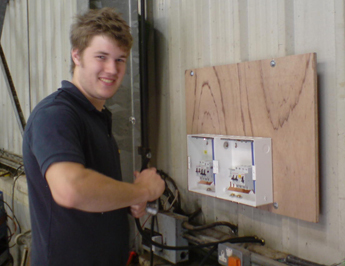 The schemes being run by various approved bodies seem to be able to approve trades of what ever electrical experience or not, whether plumbers, kitchen fitters, bathroom fitters, gardeners, builders even so called electricians on the basis of a few hours visit, or a 3 or 4 day course for part P status as a full scope or defined scope electrical installer. However, it exists and must for the moment be complied with, and if you require building regulations approval to sign off works to your house you must obtain a part P certificate for the electrical works if they came within those requirements, and similarly when you come to sell your house you will be asked for certification for any electrical works carried out which would have been subject to the regulations in force since January 2000. So what areas of electrical works require Part P certification? What are the requirements for a Part P Certificate? All cables to be routed within the building structure within specific Safe Zones, or be at a greater depth than 50mm below the surface, or be within an earthed conduit or earthed sheathed cable. In new premises there are also specific height requirements for instalment of switches, sockets and distribution boards etc. All electrical works must conform to current edition of the IET (IEE) Wiring Regulations, which includes Installation certification. There will also be smoke/fire alarm systems and ventilation requirements for some type of installations. Who can issue the Certification? For specific areas defined scope (i.e. bathrooms, kitchens, swimming pools, saunas and any other areas where works maybe carried out by other trades, defined scope approved Part P (competent person/business) maybe sufficient. You will need to check if they are certified for the exact works involved. OR If you do not employ the services of a part P approved person, it is still possible for electrical works requiring part P certification to be carried out. This is achieved by providing 3 weeks notice to the local building regulation authority for your dwelling, that you wish to commence such works. They will make a charge and should provide an inspector to check that all the works from installing the wiring to finished test and inspection, prior to energising conforms. The exact process will be advised by your local authority.